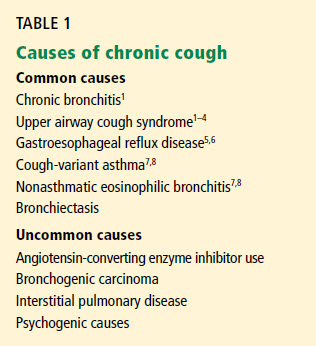 What to do about a chronic cough. By Paul Goldfinger, MD, FACC. The definition of a chronic cough is one that persists for more than 8 weeks. A persistent cough is a symptom, and it is not enough to merely take a cough suppressant. The cause of the cough needs to be found, and that can be a difficult problem–sometimes there is more than one cause in a particular case. Codeine is a very effective cough suppressant, but do not take codeine for more than a couple of days. It is an addictive substance. 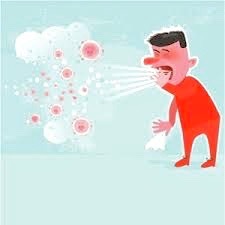 A persistent cough can cause all sorts of complications including loss of sleep, fractured ribs and hernias. If you have a chronic cough, don’t neglect it–get to the source. A cough usually means that something is irritating the tissues in the throat and upper airway. Among some in that category are air borne irritants and allergens (such as from pets, dust,smoking, pollen, chemicals, and mold.) I have a particular interest in mold as a cause, and Blogfinger will do a piece on that. The first stop in your quest to get answers should be your primary physician in order to obtain a comprehensive history and physical examination. That workup should include screening blood work and a chest xray. For example, an alert physician will ask you if you take a high blood pressure drug called an ACE inhibitor. That class of drugs can cause a cough. 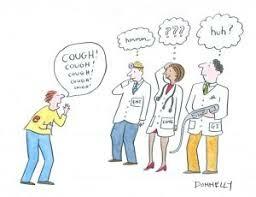 When I saw a patient with a cough I would always ask that question, and it is a big thrill for a doctor to cure a scary symptom by just discontinuing a medication. Sometimes a post nasal drip due to sinus inflammation or infection can be the problem, even if you can’t feel a drip in the back of your throat. Physicians refer to “upper airway cough syndrome.” So the second stop in seeking help should be a consultation with an ENT (otolaryngology) specialist. He might use a scope to check your sinuses from the perspective of the back of your throat. He also might obtain sinus xrays or even a CT scan of the sinuses. Another common cause is gastroesophageal reflux (GERD) which can be due to a variety of causes such as hiatus hernia, ulcers, and esophageal disease. Such reflux causes acid to enter and irritate your upper airway, resulting in a cough. A gastroenterology evaluation would be warranted if that diagnosis is suspected. Sometimes doctors will try to get a clue by a therapeutic trial of antihistamines for allergies or H2 blockers (eg Pepcid) for reflux. But finding a drug that helps symptoms does not eliminate the need to pursue an etiology.